I like the Duggars, oh yes I do! (I like the Duggars. How 'bout you?) Ok, sorry. Apparently I've been reading one too many Suess books of late. 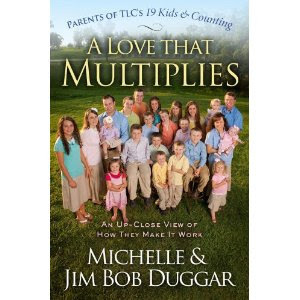 At any rate, I was delighted to discover that the Duggars had a new book out - A Love That Multiplies - and I was anxious to read it. I read The Duggars: 20 and Counting (linked to my review) awhile back after watching several of their television episodes online. As I have said many a time, I really do respect their family. I respect them for a lot of reasons, even though I do not personally plan on having that many children. I do not believe we must base our respect of Michele and Jim Bob based on the number of children that they have in their family. Now before I get going I should say that Jonathan and I think that children are a blessing from the Lord. We're fans of large families. With only three children I was asked once if they all belonged to me and after I responded in the positive the commentator was impressed that I had three. We have already had people assume that we're done having children ourselves, now that we have a girl. (We're not saying whether or not we're done. You can just be surprised.) We are very familiar with Bill Gothard and the Advanced Training Institute. We also receive Vision Forum catalogs in the mail. We are aware of what the Quiverfull movement is but with only three kids I think you can safely assume we're not in it. (Neither are the Duggars, for the record.) I personally think women should dress with more modesty than they do these days but I do not personally enjoy wearing skirts and dresses all the time. We think children should learn to be polite, respectful and obedient though and we like the way that the Duggars all get along well with one another. We like the fact that the Duggar children are all responsible for different tasks/chores around the house and would submit the argument that it wasn't until more modern times that children were viewed as having the "right to play" all the live long day. Teaching a child responsibility and a good work ethic is not a bad thing. We also like to play and have fun - just like the Duggars make a regular habit out of doing. We have a lot of similarities in beliefs, and a lot of things we disagree with as well. But I think we would like them very much were we ever to meet them in person. Ok. There. I think I answered all of the prior commentor's complains and "accusations" against the Duggars which were left on my last book review of theirs. How DO they provide, financially, for their family. Do they ever eat vegetables? When they do date? Or do they? What was it like for their family to deal with the birth of a preemie who needed hospitalized care? These questions and more are answered in the book in the same conversational way in which they wrote their first book. This is a very quick and easy read. As Shonya said of it - it's a great summer read. I know we're at the end of summer here, but it's fun and friendly and therefore I highly recommend it no matter the season. I was encouraged by their outlook on life, the way that they approach work and play and the way that they love each one of their kids. I think this book is worth a little positive attention - as is their family. Welcome back after your little break. I missed your 9 AM (my time) postings since I'm typically on the computer then. I read a previous book and enjoyed it. I've never seen the show--would be fun to watch, I'm sure. Thanks for the review! I may have said this when you mentioned them before, but everything I have ever heard about them makes me like them though I have never seen their show or read their books. I like what you've said of how they handle the negativity and how they just live their convictions without a chip on their shoulder. That's the one thing that bugs me most about some of the movements you mentioned -- not that people have differing convictions but that they feel every Christian ought to think that way, too, and the Duggars don't seem to do this. You know, I'd never thought about the vegetable question until you mentioned in your post. I'm very curious about that now! I've been DVRing episodes and watching one on some of my early mornings. (They're actually in my post tomorrow). chuckle, your "disclaimer" at the beginning of the post tickled me! :) I'm rather surprised at how much I am using this later book as a resource, but they referenced several things that I flagged (what can I say, I'm addicted to those little post-it flags) and I've gone back to look at a little more closely. We discovered 2 early seasons of The Duggars on Netflixs this summer. My kids and I are hooked!! I have a lot of respect for them. They say children are a blessing and then they back it up by having a lot of them. And people call them crazy for it. Even the folks who also say children are a blessing. Funny how no one ever says "Please God, don't bless me with more money, more friends, a better job, etc." But after the standard 2 kids people say "Thanks God, but I've got all the blessing I can handle." Anyway. Watching the old episodes is especially fun for us because we visited my parents this summer who live in the same county. We really enjoyed an episode when they go to the Safari in Gentry, AR to help feed the animals. My parents live on the other side of that town and we drove through the Safari. Also my kids rode on Jewel the Camel, from the Safari, who appears in a Christmas episode. Too fun!! I like the Duggar's too. I clicked through from my reader to take a look at the controversial comments--but apparently your disclaimer has done its work well! Sounds like a good read, Carrie. Though I know, generally, who they are I personally have never watched their show or read anything by them.